Our new Antil bending robot represents a technological evolution of the popular APR series, with redesigned mechanics, innovative hardware and new software controllers. The new software provides even faster programming, while improved performance delivers higher productivity and better return on investment. The APR Bending Robot can carry out automatic bending operations with the traditional hydraulic press brake. This minimises the number of staff required and can even run through the night to optimise productivity eliminating human error and risk. Proving itself to be a huge success in the sheet and plate fabrication industry, Antil Robotics has been developing these machines to handle up to several hundred kg loads. 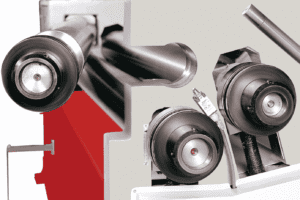 The APR Robots remove the need for two operators when folding heavy loads and large thin sheets. The APR robots are 5 ames NC controlled and very easy to use. Very little training is required compared the fixed robotic arms. The operator manually designs, runs and folds the material adding any corrections required and saves the programme into the press brake controller as normal, He then teaches the APR Robot every step of the saved programme driving the arm with the joystick controller. Every position of the APR arm is the recorded and saved. The saved program can be recalled at any time. 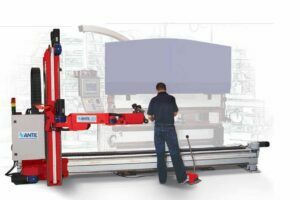 The key advantage of the APR Robot is that it can turn a pressbrake into a production machine which can be switched off and parked when not required to allow the operator to perform small batch work manually. 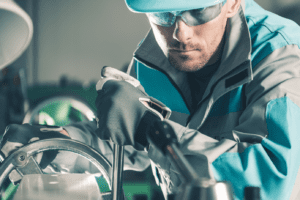 The Antil APR robot boasts 5 positioning axes that effortlessly executes any bending, tilting or rotating operations that would normally be carried out by the machine operator. Another great feature is the overhead gantry design which allows forklifts to continue freely feeding and removing material. 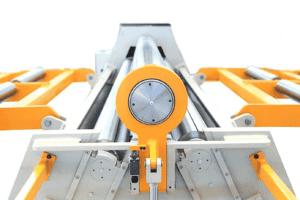 Most CNC robotic arms are fixed in the front of the press brake preventing the press brake from switching back to an operator controlled machine. Another negative of fixed robotic arms is the maximum distance required from the press brake to swing large pieces. Due to the gantry and long arm on the APR Robot, large pieces can be turned and folded with ease.